I definitely know what dorm life and college houses are like. Been there, done that...no space, lots of roommates, and lots of stuff! From suite-style residences to Greek houses, small and frequently shared quarters can be a tight squeeze. But this school year, don’t let cramped spaces limit décor possibilities. To maximize space, style and organization, add SANUS®, the #1 best selling TV mount brand in the United States, to the college prep checklist. It will definitely be a lifesaver and create more floor room in your bedroom, living room or even kitchen! 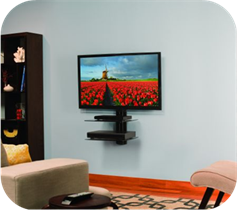 It takes away a bulky TV stand and mounts your TV up on the wall for all to see! Moving to college leaves students longing for the comforts of home—from bountiful space to more than basic cable. Mounting a television is an easy way to transform any college living space into a sleek, cozy retreat, away from busy campus life. SANUS mounts extend, tilt or swivel to provide the best viewing angle, while also freeing up valuable surface area on top of furniture that’s perfect for storing books and knick knacks. College is a big adjustment for students, but making living space comfortable shouldn’t have to be—SANUS is a smart solution for the majority of students who are tight on space. SANUS’ sleek mounting solutions are engineered with top industry technologies and tested to UL2442 standards, guaranteeing both style and safety so have no worries sending these mounts with your kids to school! We have a SANUS mount for each TV in our house and we love them! I don't think we will ever go back to a bulky TV stand again! Buy It: You can purchase SANUS mounts at Best Buy, Costco, Target and Walmart stores, as well as local audio and video retailers nationwide.